The Nintendo NX - a name that will likely change - will remain a mystery until Nintendo unveils it in 2016, yet a combination of logic and speculation have allowed a partial picture to form. Just recently Tatsumi Kimishima commented that it's "something unique and different" from the Wii U and Wii, a new departure for the company. Piecing together comments and business moves from recent years we share the view of many that what we could see is a system that has functionality both as a home console and portable. That's one idea, but it's likely that Nintendo is seeking to find a concept that is accessible but diverse, while also capturing the public's imagination and making use of modern online features. A patent shared on NeoGAF, which was unearthed from its filing in June 2014, is absolutely fascinating on that score. It plays into some ideas of what NX could be or how it may operate, so while it is only a patent that could ultimately mean little, the detail it contains certainly raises intriguing possibilities. 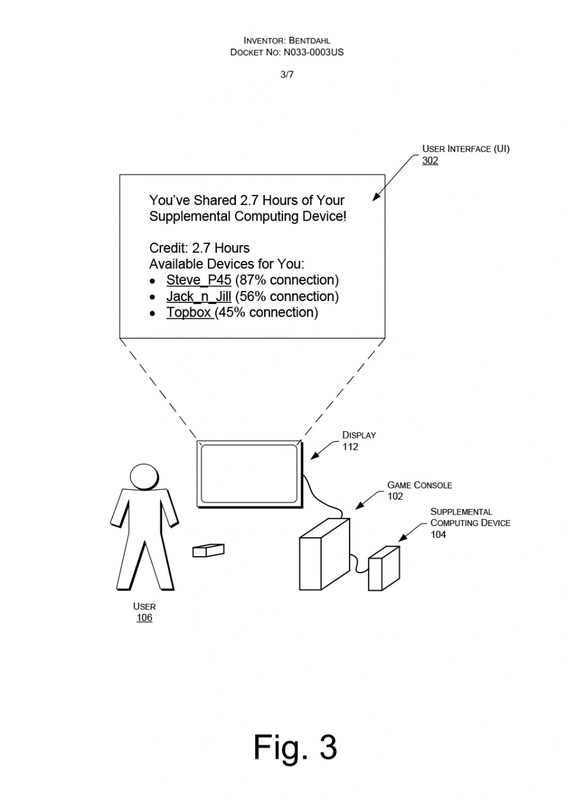 The main feature of the patent is a Supplemental Computing Device (above), which can be combined with a dedicated gaming console. By utilising the cloud and its own internal resources, a game console could use its own device and the power of others through the cloud to boost performance - imagine a console with a set amount of capability, which is then boosted and enhanced by a supplemental device in the house, and potentially further with cloud resources from other people's devices. Some relevant excerpts are below. A gaming system, comprising: a game console comprising one or more processors configured to locally execute a game and provide video output of the game to a display and audio output of the game to a speaker, the game console including a physical network interface and a wireless communication interface; and a supplemental computing device configured to detachably couple to the game console via the physical communication interface, the supplemental computing device comprising: one or more processors configured to provide, over the physical communication interface, processing resources to the game console to assist the game console in locally executing the game; and memory for receiving data associated with the game from the game console and storing the data for later access by the game console wherein the game console is further configured to couple, via the wireless communication interface, to another supplemental computing device, the another supplemental computing device including one or more processors to provide processing resources to the game console and memory for providing storage resources to the game console. ...Relatively close supplemental computing devices may be able to provide services at a nearly real-time speed (e.g. processing real-time graphics and sound effects), while relatively far away devices may only be able to provide asynchronous or supplementary support to the events occurring on the console (e.g. providing for weather effects in games, artificial intelligence (AI), etc.). In some cases the supplementary support provided by the supplemental computing devices could be based on a best-effort basis. For example, in a computer chess game, some amount of onboard AI may be possible on board the console to provide relatively quick analysis, but supplemental computing devices may perform additional AI analysis. If the additional analysis is not received from the supplemental computing devices within a threshold time, the console can use what is available to it (e.g. the analysis done by the console or by any supplemental computing device that has returned its respective AI analysis). This patent seems to be aiming to offer an alternative to standard centralised cloud computing, which has only had mixed success, with this system of supplemental devices that provide both physical and cloud-based boosts to performance. Intriguingly, this device operating as a service - via the cloud - to others seems to be suggested as a tie-in with the My Nintendo account service. We already know that this loyalty program will seek to reward players for time playing games, for example, with rewards varying from eShop unds, to DLC content and more besides. The connectivity proposed here means that, if you allow your device (and internet service) to be used to support other player's systems via the cloud - perhaps when you're not using it - that could bring rewards. In some instances, a user may be compensated based on an amount (e.g., time, raw resources, etc.) that the user shares his or her supplemental computing device or indicates that he or she is willing to share the supplemental computing device. This compensation may comprise any form of value, include access (e.g., time) to other supplemental computing devices maintained by other users, discounts on games, access to certain game content, points for redemption for digital or physical goods, information for display (e.g., as a badge) on a social network, or the like. Some feel this may point to a hardware setup in which a system with portability is then given a boost in power when plugged into the supplemental device and played through the TV. That seems plausible, certainly, if Nintendo is to seek ways to provide a good value product that isn't excessively expensive when also providing reasonable power and flexibility for both developers and gamers. Of course, anything using Cloud computing - even if it's a clever workaround like this may be - faces challenges of connectivity and performance, while ensuring that any product is easily understood and embraced by a mainstream audience is vital. This may not come to bear in NX in any way, though the concept and the mention of My Nintendo-style rewards has piqued our interest. We think this is a fascinating patent, but let us know what you think in the comments. Could this feasibly be an insight into Nintendo's future hardware, or is it another concept that'll be left to gather dust in the patent office? Time will tell. Interesting that you pointed out that this could be a handheld device plugged into a supplemental device connected to your TV to make it a home console. It certainly promotes that rumor. My initial thoughts were more akin to a supplemental device you could plug into your existing console. I.e. if you already own a Wii U, instead of buying a whole new console, you buy the supplemental device to boost the power to that of the new one. Either implementation has exciting possibilities. Or maybe its a way for Nintendo to release powerhouse systems without completely sacrificing their family budget prices. I.e. If you are only looking for casual or low power games (2D platformers or party or Indie games) you only need the NX 1. If you want to play the more intense complex games (3rd parties, 3D action, graphically superior games) you will need to attach the NX 2. This is really cool. Using multiple devices, and multiple processors, to get more work done can definately help nintendo compensate their systems' notorious lack of power. 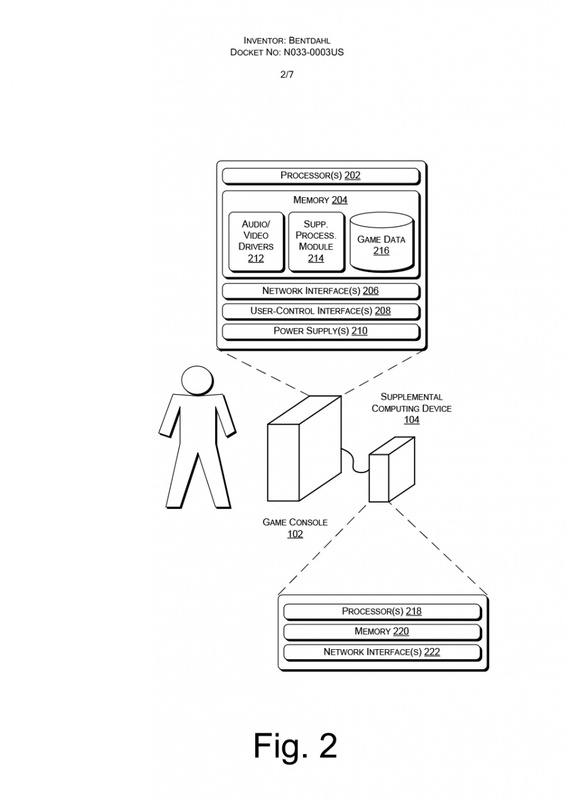 Nintendo patents lots of ideas that it doesn't actually use. Bear in mind that internet speeds and whatnot are not that great throughout much of the world so cloud gaming will be a difficult sell to many people, and Nintendo previously didn't go HD with the original Wii due to the low install base of HD TVs at the time, so Nintendo has a precedent in not pushing out features before the tech install base is there. I don't think NX will be cloud based. Oh please no. I do not want cloud computing in our gaming. At least not until the Internet can be accessed anywhere and everywhere on and off Earth at high speeds with ultra-stable connections. A supplementary device meant to improve/add what the main console lacks, imo, sounds like a bad idea, considering it just makes a bottleneck at the point where the device connects to the main unit and not a full upgrade like one would expect when upgrading components in a PC. I've had similar ideas and hopes for Nintendo in the past, if they do this then i think there is tremendous potential. Upgradable consoles, consoles with PC and Cloud capabilities and connectivity, i think this is the future of console gaming. That would have made a great band name back in the 70's. They just would have gone by S-C-D though. Maybe it's a way to use your wii u gamepad anywhere. A new game boy iPhone like device with buttons similar to the bottom screen of a new 3ds. This device can play game home and in the go. Maybe not a phone service, but at a friends house through wifi...maybe use your wii u gamepad to stream/play nx games in some capacity...I know I'm excited and I'm sure it will be awesome in its own way. My wii has been a daily use device in my house hold by the entire family, wii u included. I doubt nx will replace that. But maybe it will replace why we still feel the need to own ps3s...Or even ps4s...I also think there is s chance that there will be vr headset someday. Play capt toad and imagine the gamepad as a vr headet. It practically is. If this is implemented and marketed properly, this could be the future of console gaming. My question would be software-related: portable games make sense for the SCD, but are we going to have games that require both units combined with cloud resources as well as games that only require just the base without the SCD? That could easily confuse potential buyers, especially that critical casual group Nintendo wants to bring back. I also am still not convinced that Nintendo is willing to release a console that requires an internet connection. @gaga64 I disagree. A common argument for the Wii is that I catered to only casual gamers. That along with its price for it 100 mil sales. And up until recently casual games were still made and still sold on the Wii. So if all those gamers are fine with having a library with less intense games, I think that market still exists. Even the Wii U has 10 mil sales with many games not requiring the full processing power of the system. I would think that most of Nintendo's first party games would work on the core system with Zelda or Metroid being the most notable exceptions. And Nintendo has some experience too as the N64 expansion pak and the Wii motion plus are precursors to this idea. The patent sounds like the "supplemental computing device" would be optional and would be used to create a Peer-2-Peer cloud network that would be used to boost the existing online infrastructure that Nintendo already has. In practice, the Peer-2-Peer cloud would strenghten online based games so that they wouldn't just rely on Nintendo's servers. I'm not seeing the NX specifically in this patent nor a portable gaming console being the "supplement". It seems like the idea is to have both the portable and the at-home consoles part of the same ecosystem and running the same library of games (albeit at somewhat different capacities). The portable in this patent would be what they're labeling the "Game Console"; the reason I suspect this is because the patent shows that the "Game Console" and the "Supplemental Computing Device" are two physically separate and distinct pieces of equipment connected by a cable. If those two boxes were meant to always be tied together inside the home, why not build them together into the same piece of hardware? One slight issue with that theory is the existence of the separate "Control" device shown in Fig. 1. However, that controller is probably solely for at-home use; when at home, you plug your portable (the "Game Console") into the "Supplemental Computing Device" and leave it sitting next to your T.V. It wouldn't make sense to have to use the portable as your at-home controller, because there'd be the network cable tethering you to the Supplemental Device, and no one likes wired controllers these days. It's like when people use their laptop like a computer tower when at home, using it only for its processing power, and connecting it to a separate T.V./monitor, wireless keyboard and mouse, etc. If the Supplemental Device's additional processing power were totally local (i.e., no cloud computing), I'd be pretty intrigued. But the fact that the added juice comes from cloud computing really bothers me. Years into the future, when the console is discontinued and most users no longer play it (or even have it plugged in anymore), and even later when the network is shut down, the thing will be a useless brick, and the "enhanced" games will no longer be playable at all. This is exactly the opposite direction in which I wish the game industry were heading. Now, if the Supplemental Device only adds capabilities that are solely related to online play, it wouldn't be such a big deal, because we already know and accept that online services will eventually disappear due to servers being shut down. But if the Supplemental Device adds additional processing power for something like local single-player campaign, then it pretty much confirms that even locally-played, non-online games will only last as long as the network lasts. A sad prospect for the future of the hobby if this is truly the direction Nintendo chooses to go. Well, it sounds really interesting. Even the way they seem to be designing the cloud computing system (the console using what is available to it at any given moment: it's own power, that of the SCD or that of the cloud network)- And if the system works worldwide, then I'd gladly leave my console turned on while I'm sleeping so others can take advantage. Oh, and they reward you for that! What's not to like? Now onto the console itself... Turns out it's almost how I imagined my perfect console. A portable, like a 3DS a Vita or otherwise that you can take anywhere or plug it to a dock at home that expands its capabilities and lets you play the same games on a TV with better graphics, performance or additional features. Imagine Smash for 3DS was the only Smash but you could connect the 3DS to the -optional- dock and get at home a version like that for Wii U. One console, one game... an optional dock and two ways to enjoy the same game. Love it! Streaming services like OnLive have suffered from latency which is caused by distance between the user and the data center (note how well the demos always worked at gaming conventions when they had a server in the same room). By distributing servers to the people in the guise of game consoles, Nintendo can assign you a server which is in your same city. And considering how little broadband competition there is in the US, it's quite likely you'll get assigned a server on your same ISP, meaning the traffic doesn't even go out over the internet (even less lag). All without Nintendo having to build out their own data center infrastructure across every country. Genius. What if the supplemental device is a mobile phone or something similar. For instance, if the supplemental device contained all the phone functionality except for use as an actual phone, then essentially it is a smart wireless controller - with memory, CPU, graphics display, inertial sensors and cameras. Why buy a Wiimote for $50 say, when there are so many more capable mobile phone type controller devices available today for the same price. The wiimote is nearly 10 years old, yet phone technology is cutting edge and beating PC technologies. Here's a thought. Maybe "the NX" is an ecosystem or products. You can guy the portable one and have the ability to play those games. If you buy the home console one you can play those games either on your TV (via HDMI) or on your portable (via WiFi). Want to play some Wii U/Wii games? Well if you have a Wii U on your network that will work in the same way with just a software update. Games on your PC? No problem, if you have an NX box on your network it'll stream to your PC. So instead of a huge server (like what XBox One cloud computing promise), this utilize a network of Nintendo console and used idle console to provide computing power to the other while rewarding the idle console user. Pretty cool I think, it's P2P like Torrent, except the performance might fluctuate with each connected devices, as not everyone has the same internet. More intriguing is the local one, this definitely bring possibility of handheld console that could harness the power of home console unit while playing on bigger screen. Whatever it is, this boost another hype for NX. I'm a little worried about that mysterious item #100 with an arrow pointing to nothing in the diagram. I've never been a fan of game consoles that come with a ghost. Any supplemental device risks fracturing the user base. Mention of the SEGA 32x is never far away. Nintendo will of course be very aware; presumably this is why in the past they have talked about the iOS approach of having a base game and an 'HD' version which requires better hardware / an upgrade. This sounds very similar to some the early patents Sony had for the Cell Processor / Cell Broadband Engine. I really hope this is one patent that isn't used for a very own time. My Internet is very slow, so if cloud computing is needed for the ultimate experience, then Iwwon't be able to access it. It'll be a great idea eventually, but not until everyone has great Internet. If it's an add on for the Wii u it will fail! People won't go out and buy the Wii u after its 4 years old and then buy an add on. If it's a system you buy that's a build your own type thing with multiple parts it will also fail. People want to just pick something off the shelf and plug it in. I hope they're not stupid enough to make that an integral part of the console or even just the online experience. Because that would disqualify the console for gamers with slow or no internet. weird. if nintendo does not release a fully portable console and crush the competition, they are idiots. seriously, fallout 4, the whole game, on the go on a giant gamepad system, which you can also connect to a tv at home, who wouldnt want that??? whatever this cloud biz is, i dont care. sadly nintendo is dumb and will most likely make something that no one actually ever wanted..
@Shadowkiller97 ...but the Wii U has a low install base. People already think the Wii U is a controller. Why would they buy a device for a system that people just think is an add on in the first place? That's in reference to what you thought it was. 1. If they advert the cloud system of a new console as a way to improve its "power", they are bound to pull off too much potential consumers: why would anyone who has not a perfectly working high performance connection to th einternet be willing to purchase a console they would not be able to play several games in good conditions (or worse not able to play them at all). 2. The device boosting performances of the main devices is also a pull-of: this has been tried since the prehistoric times of the videogame consoles and it was never a good deal (not enough exclusive games to sell the bonus device). Even if the offer is good, how many players will bother with a supplemental thing ? And what about the average people (those who could not even start with the Wii U because they saw the Gamepad as an independant gaming tablet)? They will simply think this is too much to handle. @ouroborous so the people who are dumb to buy the Wii, DS, GBA and many are idiots? wow. While it is using cloud computing and therefor needing some type of internet connection, the wording makes me think these systems can also work with each other in an offline network with no internet required. Similar to how iPhones can pair with macbooks to pick up calls or use other processes...but much more useful in the sense where it's boosting game performance. And this is how a hand held can run a full console game. @Rei to add to #1 even when you have fast stable internet I don't really want cloud streaming. Other things like streams, torrents, and other online games in general gobble up bandwidth. I don't really want every device in my house down to the toaster, fridge, and washing machine streaming 24/7. If true, then congratulations Nintendo. You just made a system that more or less operates like the Dreamcast did with Phantasy Star Online (VMU and modem assisted). All they're doing is replacing the supplementary computational device (probably will be a fully fledged portable console device), this is nothing new. The execution and technology might be different (hopefully it won't rely too much on the supplementary device for process functioning), but the underlying concepts are the same. The "cloud" is nothing more than a network of remote servers. It's basically what MMO's have used as a backbone for almost 20 years now. "Cloud" is just a marketing term to make it sound appealing, like it's all just a nebula of retrievable data without form. Even real clouds have a physical composition, though, and the servers behind these "clouds" are no different. It's obviously essential for online games, but for single player and local multiplayer, it's an absolute nightmare (see Diablo 3 PC, especially at launch- couldn't even play the game single player because of server failure). I would advise Nintendo to not go down the digital only path, nor the "assisted cloud operation" path for everything, just yet. Then again, this could all just be a generic patent they want to keep on hand for whatever reason, since it's a generic extension of the Wii U's concept. I love it, it looks as if Nintendo are building a fully scaleable OS, PC-style. Play a hi res game at home, play the lo res version on the move on your handheld (and vice versa). Cluster computing is also the best solution to Wii U's main problems: a power drop off when showing anything on a second screen, and network slowness. 8 machines in a wifi Smash Bros match all lending processor power to the game, so there's no slow down. @tysonfury Except for those pesky bottlenecks brought about by the grossly uneven performance of cooperating sets of instructions by drastically mismatched processors, as Discostew mentioned. (Same thing encountered by pairing a strong GPU with a weak CPU/motherboard in a PC, or vice versa.) Lag and dropouts, ahoy! @PlywoodStick just wait till you finally got that ultra rare item or finally beat that super hard challenge after countless hours of practice. "Connection to server has been lost all unsaved progress is lost". @Yorumi NOOOO stawp it! I'm getting flashbacks! The dreaded FSOD (freezing screen of death) is the bane of my existence! @arojilla yes. I want exactly that. I don't think a device that has two barriers to entry (the console and then the add-on) to play games would be a good idea. That thing would be guaranteed to be dead on arrival. We have the Sega CD, 32X, N64 DD, Playstation Move and Kinect to remind us of that. @burninmylight I think if the marketing was right, it could work. Make it noticeably distinct. Call it two different things. Color code that game disks, I.e white for the core system and black for the advanced. If you are an avid gamer, pay more and buy the whole thing and play every game. If you are a light or party or family gamer, pay the for just the core system to play those types of games. Then if you want more, you can easily upgrade. Already in the DS/3DS games, I could not stand the fact that some games required an internet connection to unlock some parts of it (who were already in the cartridge for the DS, and mostly already in the gamecards for the 3DS). Even though Nintendo has been extremely tightlipped and would never comment on this patent, I just have this feeling looking at the diagrams that THIS is what NX will be, or at least a rough outline that is vague enough to not give away too much detail should a competitor catch wind of it but specific enough to make it harder for Micro$ony to "borrow" the idea should it prove to be a hit with consumers. That supplemental computing device tho WTF is it? Is it NX portable or maybe a PC. A PC could be a cheap way for NIntendo to boost graphics performance but they're really vulnerable when connected to the internet and would be an easy in for hardware hackers and modders. It's 2015 world. Let's make that Internet free! Considering I can barely use my own internet for myself without getting charged extra from Comcast, I laugh at the idea of having to share it with other people not even in my house. It's a cool idea, but simply not feasible for so many people.